When I first received this book for review I looked at the cover and thought this was to be a superficial and fluffy look at celebrities and their fanciful wine projects. How wrong I was. 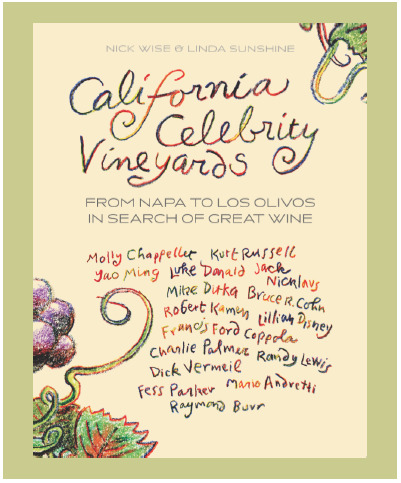 Instead, this book offers a personal, insightful and detailed look inside the vineyards and wineries owned by celebrities, presented by author Nick Wise, someone who has written extensively about wine and has the expertise to illuminate our curiosity about celebrity involvement in wine, along with co-author Julie Sunshine, a master sommelier and author of more than fifty books. As the subtitle of the book suggests, they traveled together throughout California from Napa Valley in the North to Los Olivos in the South interviewing celebrities and investigating their wine projects. Each chapter includes several pages devoted to the history of each celebrity’s wines including the extent of their devotion and involvement, accompanied by more than 250 color photographs of the wineries and vineyards theat were visited. At the conclusion of each chapter are Nick Wise’s tasting notes of representative wines offered by each celebrity. The information is presented in an informative matter on the scale that one might find in some of the more prestigious wine publications, but with an even more detailed message. The book could easily serve as a consumer reference source for all the included wineries. Celebrities in the book have careers that include sports, directing, acting, race car driving, chef and rock band manager. Some, like Robert Kamen of Kamen Estate Wines in Sonoma and Kurt Russell of acting fame, are winemakers who delve seriously into the vinification of wine. Others play a more supervisory role, such as Molly Chappellet of Chappellet Vineyard in St. Helena and Fess Parker of Fess Parker Winery in Los Olivos. As a Pinot Noir enthusiast, I found it interesting that except for Kurt Russell's GoGi label, none of the included celebrities had wineries purely devoted to Pinot Noir, rather most chose Cabernet Sauvignon or similar big red wines as the focal point of their winery. California Celebrity Vineyards: From Napa to Los Olivos in Search of Great Wine, Nick Wise and Linda Sunshine, Overlook Omnibus, 2016, 304 pages, semi-hard cover, $35.